The menisci are important structures that provide the knee with cushioning. There are 2 menisci, which are both shaped like the letter C. There is the medial meniscus, which is on the inner side of the knee. The lateral meniscus is the meniscus that is on the outer side of the knee. 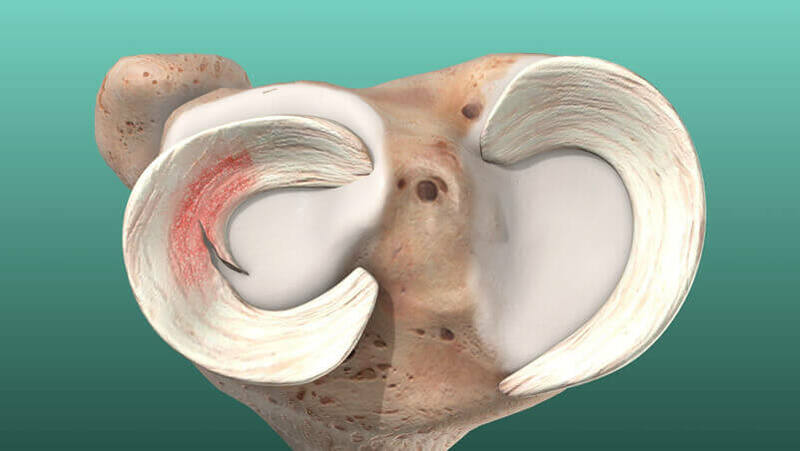 The menisci act as cushions to absorb stress within the knee and protect the articular cartilage, which is designed to reduce grinding between the knee bones. What parts of the knee are affected by a torn meniscus? The articular cartilage, which is present on the thigh bone (femur) and shin bone (tibia), is protected by both the medial and lateral menisci. The articular cartilage allows the bones of the knee to fluidly move without grinding against one another. The majority of each meniscus does not have blood flow, but the outer rim of the meniscus does receive a small amount of blood flow. The areas of the menisci with no blood flow may be referred to as the white zone. The red zone denotes the small portion of the meniscus that does receive blood flow. The portion where the red and white zone meet may be aptly referred to as the red-white zone. This is the portion of the meniscus that receives an even smaller amount of blood flow than the red zone. A meniscus tear on the outer edge of the meniscus may be able to heal on its own, but for patients with a meniscus tear towards the center of the meniscus, torn meniscus surgery may be required. 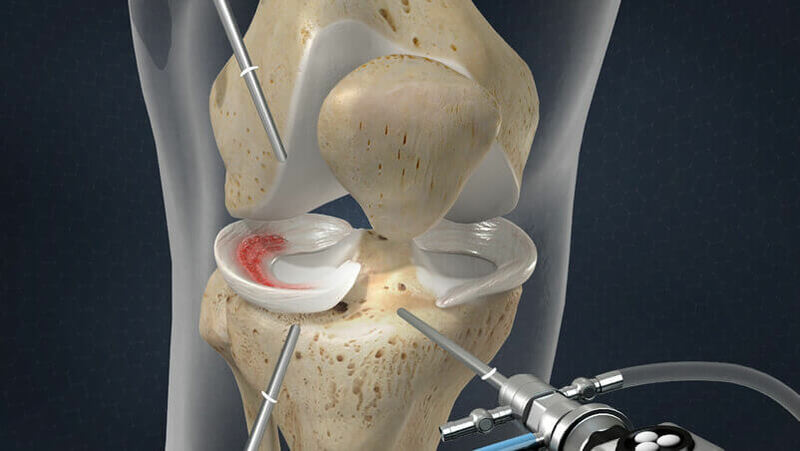 What can Dr. Rozbruch achieve with knee meniscus surgery? Dr. Rozbruch can help repair a torn meniscus with knee meniscus surgery. The menisci are very important structures within the knee that help to absorb stress and allow for knee stability. A meniscus tear may cause the knee to become loose or less stable. Without healthy menisci, you may be more prone to developing knee osteoarthritis. If you are experiencing torn meniscus symptoms, there is a possibility that your meniscus tear might worsen without medical attention. The main goal of torn meniscus surgery is to repair and preserve as much of the meniscus as possible. If a portion of the meniscus must be removed, Dr. Rozbruch will attempt to take only the smallest section of damaged tissue away, preserving as much of the healthy tissue as possible. Common symptoms of a meniscus tear include inflammation and pain within the knee. You may also experience a catching, locking, or popping sensation within the knee after a meniscus tear. Another torn meniscus symptom may be limited knee mobility due to the knee locking in place. This may occur if a flap of tissue has developed from the torn meniscus. This formation of tissue may become ensnared in the joint of the knee as you bend it, which can cause the knee to lock in place. In some cases, a meniscus tear procedure is needed immediately to fix this torn meniscus symptom. The whole meniscus will only be removed if the entire meniscus was damaged beyond repair. This is reserved for only the most severe cases of a torn meniscus, as knee surgeons will always attempt to preserve as much of the menisci as possible. What can I expect before meniscus tear surgery? Prior to meniscus tear surgery, Dr. Rozbruch may suggest a physical examination with your family doctor to ensure that you are a proper candidate to undergo torn meniscus surgery. Before your knee surgery, you may also meet with your physical therapist, who you will be working with as you recover from torn meniscus repair. Your physical therapist may show you certain exercises that you can expect to perform as you heal from torn meniscus surgery. This pre-operative meeting with your physical therapist can also be used to collect information on your current knee health and mobility. Your physical therapist may take note of any pain, swelling, stiffness, or lack of mobility to use as a comparison as you recover from knee surgery. You may also be shown how to walk with crutches during this meeting so that you are prepared to use them following your meniscus tear procedure. What can I expect during torn meniscus surgery? Torn meniscus surgery is performed through an arthroscope, which has a small camera on the end of a tube. This tube can be inserted into a small incision within the knee. The images gained from the arthroscope will be displayed on a monitor within the operating room, allowing Dr. Rozbruch a live view of the internal knee. Torn meniscus surgery is performed under general anesthesia for comfort, which means you will be asleep during the meniscus tear procedure. Once you are properly sedated, Dr. Rozbruch will make 2-3 very small incisions in the knee. The arthroscope and surgical instruments can be placed through these small incisions. Some common torn meniscus surgeries include partial meniscectomy, meniscus repair with sutures, and suture anchor meniscus repair. If a damaged portion of the meniscus is being surgically removed, the procedure is known as a partial meniscectomy. Once the arthroscope has been placed, a small probe will be inserted into another incision. The meniscus and knee will be thoroughly examined at this point of your partial meniscectomy. When Dr. Rozbruch locates a tear in the meniscus, he will insert surgical instruments through another incision and remove the damaged portion. After removing the torn section of the meniscus, Dr. Rozbruch will probe the knee again to ensure that all unhealthy portions have been removed. A solution may be used to wash away any debris from the injury or surgery out of the meniscus and knee joint. To end your partial meniscectomy, the small external incisions will be closed with sutures. As with partial meniscectomy, Dr. Rozbruch will begin your meniscus repair with sutures by making 2-3 small incisions. Then he will probe the knee until finding the section of the meniscus which has been torn. The probe will then be used to place the torn edges of the meniscus together. A surgical tool will be used to roughen the edges of the meniscus tear. A thin tube known as a cannula is then inserted through one of the incisions. A suture will be threaded through the cannula and the knee joint. The sutures are then carefully sewn through the cannula into the meniscus, bringing the two edges of the meniscus tear together. The sutures are then secured with knots. Similar to meniscus repair with sutures, suture anchor repair for a torn meniscus involves bringing the edges of the tear together and connecting them with suture anchors. Suture anchors, a special type of medical fasteners, can anchor the torn edges of the meniscus closer to one another. These sutures will slowly be broken down and absorbed by the body as your meniscus heals. Suture anchors may be recommended for younger patients who have a single meniscus tear near the red zone of the meniscus. Typically 1-3 suture anchors are required to repair a torn meniscus. What can I expect after a meniscus tear procedure? Following torn meniscus knee surgery, most patients are able to return home the same day. Surgical strips are applied to the small incisions, and the entire knee is gently bandaged. You must walk with crutches following torn meniscus surgery as to not injure your healing knee. Crutches may only be needed for a few days, depending on which meniscus tear surgery you undergo. More weight may be able to be placed on the healing leg approximately 1 month after knee surgery. In this time, a knee brace may be worn to protect the knee and avoid stress. How long does it take to recover from torn meniscus surgery? Full recovery from torn meniscus surgery may take up to 3 months. Your recovery will depend greatly on what meniscus tear surgery you underwent. Patients who had a minor tear corrected through partial meniscectomy will not require physical therapy in the majority of cases. For more severe cases or meniscus tear surgeries, physical therapy may be required to exercise the knee and legs. Initial physical therapy sessions following meniscus repair are designed to help reduce inflammation or pain within the knee. For 6 weeks following torn meniscus surgery, you should not bend the knee more than 90 degrees. Squatting should also be avoided for 3-4 months following knee surgery. Furthermore, running, jumping, or activities that put a large amount of strain on the knee should not be resumed until 6 months. It is important to follow Dr. Rozbruch’s suggestions on when to resume certain activities. Your physical therapist will prompt you to begin light exercises following torn meniscus knee surgery. The first type of exercises you will do will mainly be helping to promote a proper range of motion and mobility in the knee. As your knee heals, the exercises will slowly get more involved. Strength exercises will be added to improve the strength and control of your leg muscles. As your physical therapy sessions end, your physical therapist may provide you with a list of knee and leg exercises that you can do at home to reduce the possibility of a future knee injury. How can I learn more about a torn meniscus? To learn more about a torn meniscus or torn meniscus surgery, please request an appointment online or call Dr. Rozbruch’s orthopedic office in NYC at 212-744-9857. Prior to an office visit, please fill out Dr. Rozbruch’s patient forms to expedite your first visit.